The Alto de Letras climb will mean nothing to anyone not a cycling nerd, including me before this trip. It is the tour’s big day. People dressed in lycra come here from across the world to pedal up a hill because it is there. 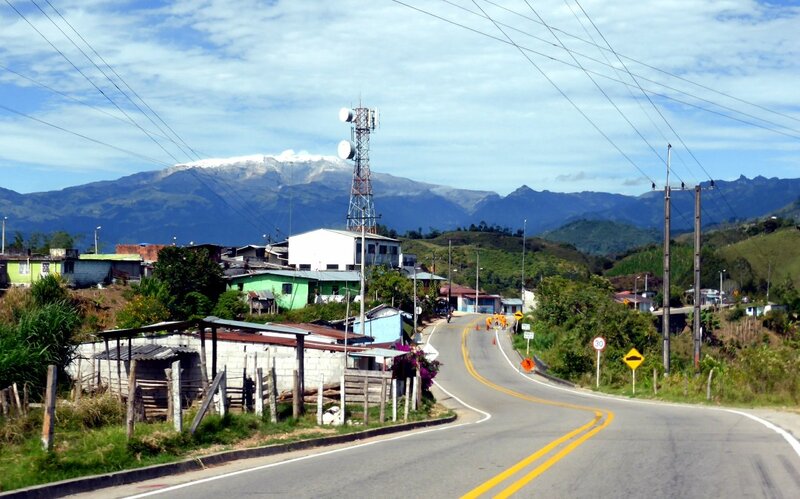 Colombians regard it as one of their ‘mythical’ mountains. 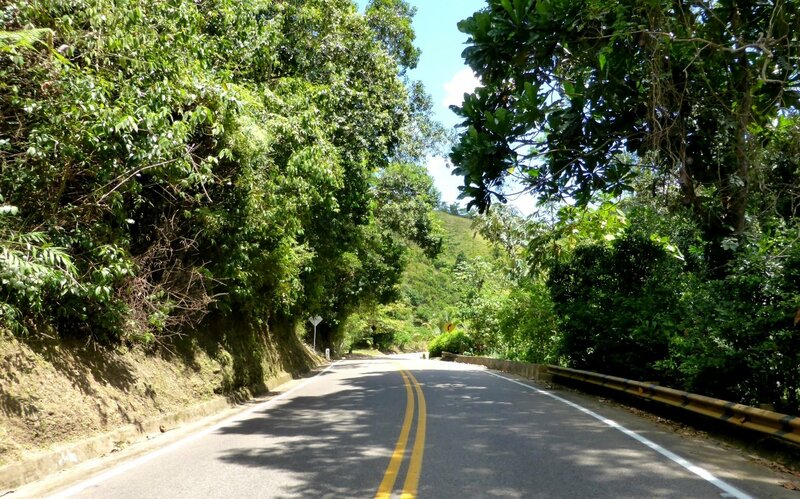 It has the reputation of being the longest continuous hill climb in the world. 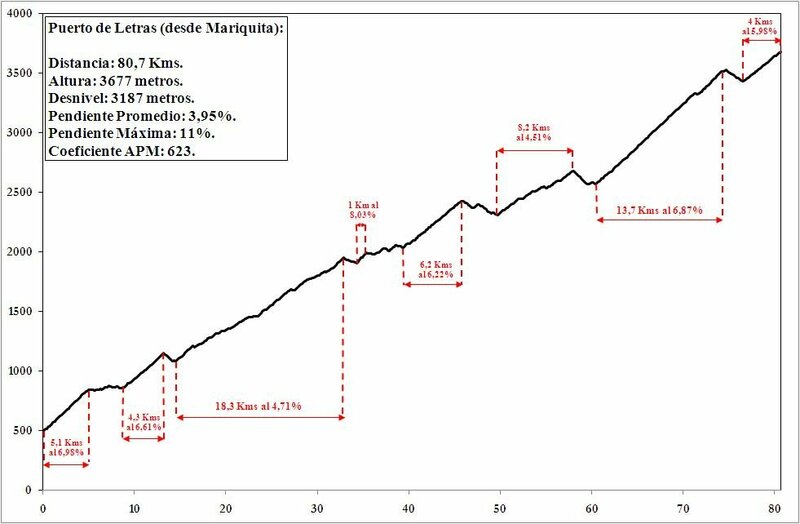 It is 83k/52 miles starting at 468 m/1,535 ft above sea level in Marequita and topping out at 3,663 m/12,017 feet above sea level. It’s not continuously uphill as there are a few descents along the way so the actual total climbing is more like 3,800m or 12,500 feet. The true climbing gradients are reckoned to be in the region of 6-10%. Letras starts at a decent altitude and climbs into thinner oxygen levels which for not particularly well acclimatised riders like us, is an additional challenge. On top of all that, all this elevation change means major changes in climate as you ascend. 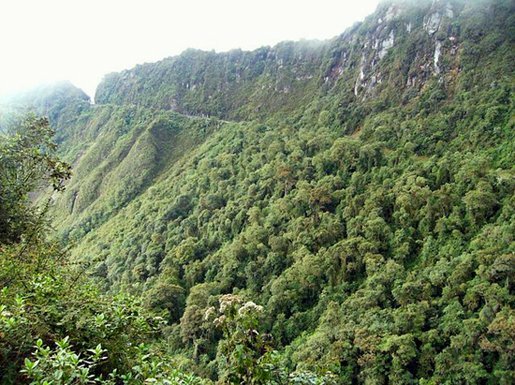 The climb starts basically straight out of Mariquita in a tropical climate which gives way to cooler coffee-country climate, which eventually gave way to cloud forest, and then finally opens up into páramo (sparse land above the tree line). So it can be steamy at the start and only 4 or 5 degrees at the top. 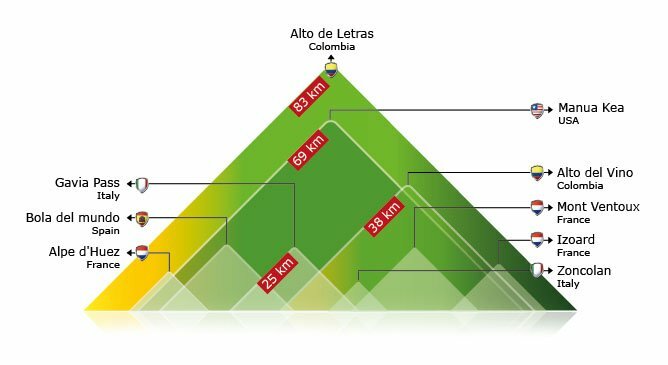 Continuing for the nerds, this graphic compares Letras to other, more familiar European climbs though I don’t think it actually means it is 10 times harder because it looks 10 times bigger. But its still a pretty mean, big brute. The first section is reasonably tough, even starting early it’s pretty hot – this is equatorial rain forest after all and it gets pretty steamy immediately. Needless to say, all of the advice is to take it easy at the start – there is a long way to go. That’s all I can ever do, just try to relax and breathe steadily and keep going. Up through the forest and eventually the views start to open – believe you me, I’m doing slow enough to have a good look. Taking a rest is good excuse to look back on what’s been done, then glance up at what is still to come. Yet again I’ve found it difficult to express the simple beauty of the Columbian landscape. It’s fertile and lush, everywhere seems to be producing something. There are many, many small homes along the road, though I’d guess that they work the land not own it. Crops galore, beautiful verges teeming with flowers. 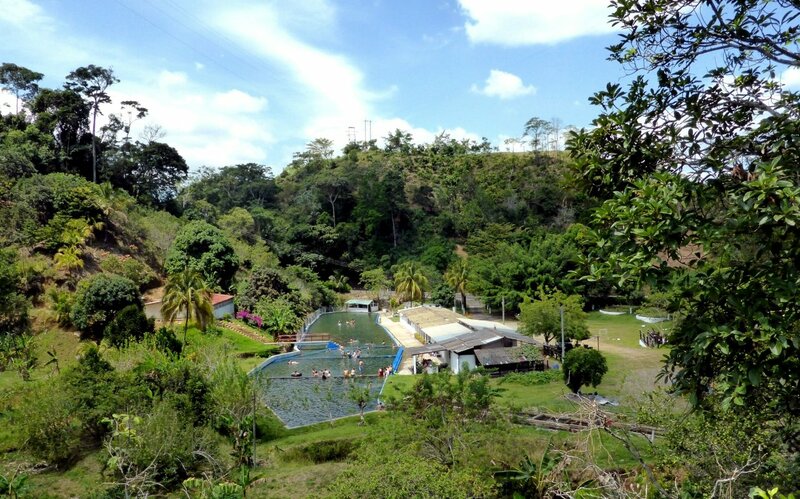 Climbing up the bananas, ferns and dense foliage give way to the more open coffee plantations, neatly marching across the hillsides and in all directions. We’re already high up so the views are huge before disappearing into the distance. It really is a beautiful place to ride. There’s even a swimming complex up there. It’s not a continuous climb to be accurate as there are a few refreshing descents to ease the legs. Most of my group overtake and leave me to my own devices. Other than us there are very few other riders but it’s a far from lonely climb. 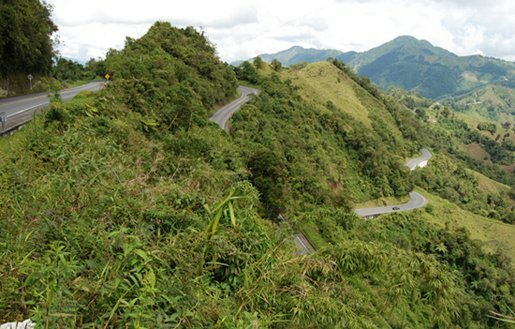 Apart from being a big climb it is also a major crossing point of this Central Cordillera so trucks and buses pass by at regular intervals. Rarely a nuisance, the trucks leave a wide berth, honking encouragement whether going up or down. And that’s true for cars and motor bikes alike. The mountain is far from empty. It holds an almost continuous throng of communities, even quite large towns. My goal is to survive and keep going. Unlike any other hill there is absolutely no thought of getting to the top because whenever you look at the distance travelled there’s still a huge amount to go so you just keep pedalling. I felt good at 25 miles, about half way and over 7 mph. So you start again, just pedalling, trying to forget the sore point between saddle and bottom, stiffness in the neck and back. After this point there are fewer people, still the cars and truck giving encouragement but a greater sense of being up high. After about 40 miles I was still at 7 mph (I’ve since read that a probable record has an average speed of just over 17 mph). This is where altitude and the thinning atmosphere is said to kick in. From here on in and for nearly 3 hours this was a real grind, fuelled by resolve and determination and that there was no other way to the top. Between miles 45 to 48 were possibly the toughest in head, legs and lungs. Around here the cloud forest certainly makes you cold, clouds drift around and the flash of lightning follwed by thunder rolls brought rain. Cold rain at that and mercifully shelter beneath an overhang. A few of my fellow travellers were in sight and this gave real encouragent, just seeing a familiar shirt helped spur me on and keep going. Well, I made it to a few drab shops and the welcome cafe (cafes are if the bare, simple and unheated kind – Celia had been able to wait in the kutchen with the women working there, to keep warm) and the best sight in the world, seeing Celia after over 8 hours of riding 82 kilometres uphill with 3774 metres (12381 feet) of climbing – my personal climbing record and one i doubt I’ll never beat. This post originally stopped here, presumably I just ran out if steam like I did on the mountain. the setting sun. 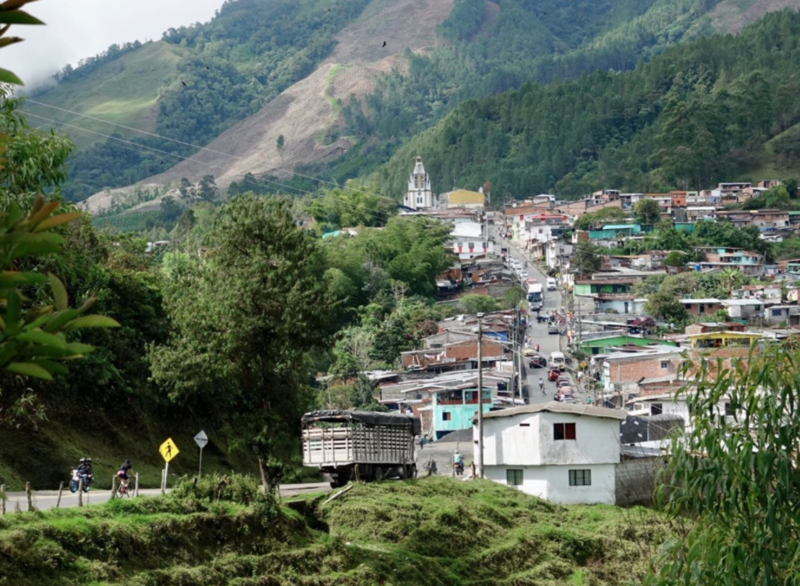 It looked like another beautiful Colombian descent sweeping down the kilometres and capped of with a manic and hilly ride across Manizales, another surprisingly large town. Comfy hotel, warm shower and I think, a well earned rest. Read this in bed, now feeling very lazy…. sounds amazing, if impossible for most of us mortals! I reckon you and Celia would be up for les cingles du Ventoux. Fancy a trip to the SoF?